Like most Asian cuisines, the wok is central to Thai cooking. Woks are used for everything from stir-fries to curries, and even noodle dishes. Woks are also used for deep-frying and steaming. . .
As the Thai food's ingredients are small quantity of fat and meat (with about 20% of fat), the Thai people, then, are fortunate in their fat taking less than the western people, and less risky of having breast cancer. The charm of Thai food depends on: Flavor, Decoration, Ingredients, Values and Harmony. . . The Office of the National Culture Commission had conducted a survey of Thai restaurants all over the world to find out ten favourite Thai dishes of foreigners. The results were . . . . In order to achieve the greatest taste sensation from your Thai cooking, be sure to start with fresh ingredients, having the right equipment, lastly know how to adjust the taste of the food to the balance of Salty, Sour, Spicy, and Sweet. . .
Is Thai Food good for you ? The Health Benefits of Thai Cuisine : Several Thai dishes, such as Tom Yum Soup, are currently under scientific study for their incredible health benefits. Of course, it's already known that many of the fresh herbs and spices used in Thai cooking - such as turmeric, galangal, coriander, lemongrass, and fresh chillies - have immune-boosting and disease-fighting power. Find out more about these. 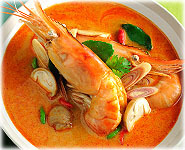 . .
For years, zesty Tom Yum Gung soup has been a mainstay of Thai cooking. And now researchers are thinking it just might have cancer-fighting ingredients as well as good taste. . . Eating chillies regularly could help people get a good night's sleep and keep their hearts healthy, an Australian university study has found. . .
Life lessons can come from the most unlikely places, once you become open to receiving them. Once you stop compartmentalizing life, there are rich insights to be gained from places you might never previously have given any thought. Like Thai food... . . When you think of Thai food, you would think of the 'Hot and Spicy’ taste and probably believe that all Thai food are very hot and spicy. That is a misunderstanding. And you may also think that we eat everything by chopsticks. That is also not true. More than 50% of Thai food are not hot and spicy at all. And chopsticks will be use when we eat noodle only. . . The food of the North is a distinctive as its culture. Steamed glutinous rice is preferred, traditionally kneaded into small balls with the fingers. Northern curries are generally milder than those of central and northeastern Thailand. . .
How do Thais eat? What type of superstitions do they have related to their food? Learn more about Thai food and culture. . . Regional Thai Cuisine Thailand can be divided into five main culinary regions, the north, the northeast, the south (including the Gulf of Thailand), the central plains, and of course, Bangkok. Each region has its own cooking style according to available ingredients and local tastes. . . Herbs and Spices are an essential part of Thai cooking. Used in combination, they help achieve a balance of the four essential Thai tastes: salty, sour, spicy, and sweet. . . Instead of a single main course with side dishes found in Western cuisine, a Thai full meal typically consists of either a single dish or rice (khao) with many complementary dishes served concurrently. 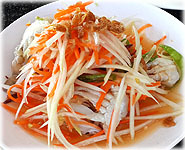 The ingredient found in almost all Thai dishes and every region of the country is nam pla (fish sauce), a very aromatic and strong tasting fish sauce. Shrimp paste, a combination of ground shrimp and salt, is also extensively used. . . The secret to successful Thai cooking lies in the preparation of ingredients ahead of time, as the actual cooking is fast and furious. Most Thai stir-fries (including noodle dishes) are cooked at high heats and for only a few minutes, which is what makes them particularly fresh and delicious. . . The recipe consists of vegetable and ingredients available in their immediate vicinity. The common meal includes steamed glutinous rice, chili sauces which come in a host of varieties, such as "namprik noom", "namprik dang", "namprik ong" and chili soups (gang) such as gang hangle, gang hoh, gang kae. . . The Thai in the central plain prefer food with smooth and lasting taste with a touch of sweetness. The way the food is served is an art in itself. The dinning table is often decorated with carved vegetable and fruit. Cuisine of the central plain sometimes combines the best of the foods from various regions. . .
Like Thai food of the north, Thai food of the northeast has steamed glutinous rice as a staple base to be taken with spiced ground meat with red pork blood, papaya salad or som tom, roasted fish, roasted chicken, jim-jaem, and rotted fish or pla rah. . .
Thai food of the south tends to be exceedingly chili hot compared with Thai food from other regions of Thailand. Specially favored dishes of the south are a whole variety of gang (spiced soup or curry) for examples, gang liang, gang tai pla, and budu sauce. . .
What Makes Thai Food So Hot? The Thais were not the first people to use chillies in their cuisine. Wild chilli peppers were first used-and later cultivated-by the indigenous peoples of Mexico and Central America. The Thais welcomed the chilli pepper to their cuisine with much enthusiasm, probably because they were already accustomed to eating spicy foods. . .
How did such a unique Thai Food taste sensibility develop? What was it about the Thai people that inspired such wondrous combinations of flavors and tastes, allowing Thai cuisine, as we know it today, to come into existence?. . . Typical meals in Thailand include rice, a soup, a curry, salad and some sort of stir-fried dish. Condiments will dress the table, including Thai fish sauce mixed with chopped chilies as well as fresh veggies such as tomatoes, cucumber, spring onions and long beans.. . .
Thailand's cuisine has a startling diversity that is a gem to behold with different regions contributing to a cuisine that is infused with a multitude of flavours. . . .
Thai Rice - For Life ! Thai rice is often sold in our local grocery stores or Asian stores as "Fragrant Rice", "Jasmine Rice", or "Scented Rice". In Thailand, Thai rice is known as "Kao Hom Mali" (Jasmine-scented Rice), because of its naturally fragrant properties. With jasmine rice's good-taste and high-quality, it's no wonder that Thailand is the number one rice exporter in the world. . . .
Turmeric is a spice commonly used in India, Thailand, Indonesia, Malaysia, and many other Southeast-Asian countries. Its magic comes in myriad forms. First, as a spice it adds both aromatic and warm, earthy tones to curries and other dishes. . . .
Thai Cuisine - Here's Your Health! Thai food offers us a delicious way to get the nutrients, antioxidants, and disease-fighting potential we need to achieve lifelong health and fitness. Want to learn more? Here are just a few of the health benefits you’ll receive while enjoying a fabulous Thai meal . . .
Zest in the Dish Along with herbs and spices, there are various sauces and other specialty ingredients essential to authentic Thai cooking that may be new to you. While some will be available at your local grocery store, others can be found only at Asian markets or specialty stores. . .
One never seems to forget encountering a Kaffir Lime Leaf for the first time. Its scent and taste is incredible-there's nothing quite like it. In fact, this leaf is so aromatic that when you're served a Thai dish containing it (such as coconut milk soup with chicken), you may not be able to tell what is stronger-the scent or the taste. . .
Another popularity of Thailand is a land of tropical fruits as the country is blessed with a myriad of delicious tropical and temperate fruits which only vary depending on the season.. . . Growing interest internationally in the therapeutic value of herbs and spices has also helped popularise Thai cuisine. A large number are indigenous to the country, and many more have long been cultivated here. They have a long tradition of use in medicine, and consequently cooks understand their therapeutic qualities in addition to their flavours. . . Variety of Thai Food : Snacks, Chili Dips (num prik), Thai Salads (yum), Soups, Curry (kang) and Desserts . . .
Researches indicate that chilli spice has no harm . If you feel hot all over your mouth after having some chillies, Taking a lot of water does not help soothing the mouth burn. It actually will spread the spice over the body. So how to handle with Spicy food?. . .
A fascinating fact with Thai food is the variety. If I lived here for a 100 years and tried a different dish everyday day, I don't believe I would have time to sample it all. The county is split into 5 regions; North, Northeast, East, Central, and South and each region, province, and sub province, all have their own unique dishes and foodstuffs. . . .
Thai cuisine is fast becoming internationally famous. The food reveals a great deal about the country – its political history, geography and trade. . . It is said that Thailand is a real paradise for fruit lovers and one can find an incredible variety of fruits all over Thailand. Thailand is abundant in fruits and it serves as one of the most important revenue generators for the country. A great number of fruits can be easily found at the numerous fruit shops, supermarkets and market places. The fruits that are available here are much cheaper when compared to other countries. Sometimes fruit sellers end up offering tourists fruits to taste for free. This practice is more prevalent on beaches where the tourists spend most of their holidays. . .
Thai food offers many delicious dishes flavored with spices, lemon-grass or coconut - although different regions of Thailand, each tend to have their own preferred ingredients - for example, coconut milk and tumeric in the South, and lime juice in the Northeast. No matter what part of the country a dish is from, all Thai dishes or meals aim to achieve a balance between fundamental flavors common to the cuisine: spicy hot, sour, sweet and salty, as well as optionally bitter. . . The following information are some essential herbs and spices used in Thai cooking. The proper combination of all these ingredients is regarded as a big art in Thailand, one that requires both skill and time. The preparation of a single sauce can take hours of grinding, tasting and delicate adjustment until the exact balance of flavours is archived. Only then, can the true glory of Thai cooking be fully appreciated. . . .
Thai food offers a variety of flavors and taste. Almost all Thai food is made with the subtle mixture of herbs and spices. Thus, Thai food is widely known for being hot and spicy. . . The fruit called durian (thai language called "THURIEN") is famous for its smell when it is ripe. Durians are often forbidden in public places such as Thai hotels. This is due to the strong smell of the durian, which persists even if the fruit has been moved to an other place. One thing is sure, nobody can steal a durian. Due to the smell it is impossible to hide it! . .
Thailand's cuisine is a tourist’s delight. 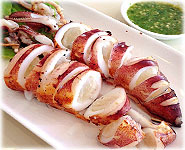 The place has an unbelievable blend of mouth-watering cuisines. Whether you want spicy chicken curry, sweet green curry with chicken or beef, or roast duck curry or mild chicken curry, you name it and you have it all on your platter. Thai cuisine is blend of the four regions of Thailand. The regions are Northern, Northeastern, Central, and Southern. . .